Get well wishes are extended to Haiden Fullmer, Harold Petrie, Ron Trumble, John Piseski, Anne Long and Lillian Harter. My condolences are extended to the family and friends of Virginia E. Pretory Wiggins, Harris Kellogg and Shirley M. Guenthner. Skunk Meadows has just dug out from the third snowfall of January 2013 and I can report on limited activities of the small creatures that live around us. We have not seen “Earl Gray Cat,” our “Prodigal,” since January 20th, and hope he has a real family who is keeping him in and safe from the snow. The warming spells between snow falls have brought out one of the raccoons who make our ranch a regular port of call in the summer. He was on the porch eating cat chow which we still put out for Earl Gray (hope springs eternal?) last night (Jan. 31) and made it up a pine tree as the snow really started to fly after midnight. On our critter cameras we have observed small flocks of wild turkeys in the front yard after the snow storms, and deer crossing the meadow at the back woods at night. The red and gray squirrels only return when the temperature gets up to 20 degrees F. Even the flying squirrels have been staying in their nests during the cold snap and didn’t even show up when the temperature rose. By day we see flocks of starlings, a few chickadees and blue jays, and the occasional woodpecker who comes for suet. Since only corn is in the birdfeeders the majority of winter birds are giving us a pass. The most determined visitor seems to be a deer mouse who lives under the cat hut in the front yard, and comes out to glean corn from under the bird feeders even in the most daunting weather. Hopefully our neighbors have seen more wildlife than we have. Bridget Swartz, library director, announces that the library will feature the art of Patty Bennett. 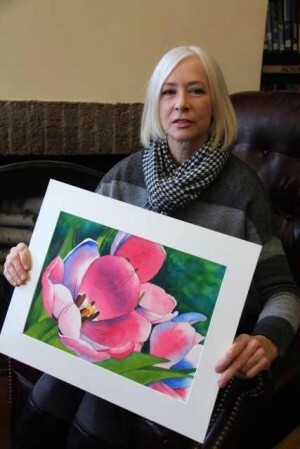 Patty is a self taught artist and specializes in watercolors. The dates for this show are February/March. She creates her art in a studio loft her husband, Chris Miller, built for her. She tells us, she has been interested in art her entire life. She also has reproductions of Parish memorabilia. Patty is donating all proceeds from the show to: Kindred Kingdoms, Wildlife Rehabilitation, Inc. in Pennellville. Swartz said, once or twice a year the library highlights a local artist from the community, giving the artist visibility and also making it possible for all to enjoy these original works of art. The Parish Public Library is located at 3 Church St., Parish. The library is open Mondays 9 a.m. – 5 p.m., Wednesdays noon – 5 p.m., Thursdays 7 – 9 p.m. and Saturdays 11 a.m. – 4 p.m.
Fine Free February at the local Oswego County Libraries! Bring in an overdue book and a non-perishable food item and receive fine amnesty all month long. The Half-shire Historical Society has many projects going on. Here is a couple that you might find interesting in getting involved with: local World War II vets and their stories or the compiled cookbook which will include recipes with a picture and short profile of the cook. Contact me or Shawn Doyle for more information. To make this column interesting and informative, we need to hear from you. Email information [email protected] or call 289-2391.